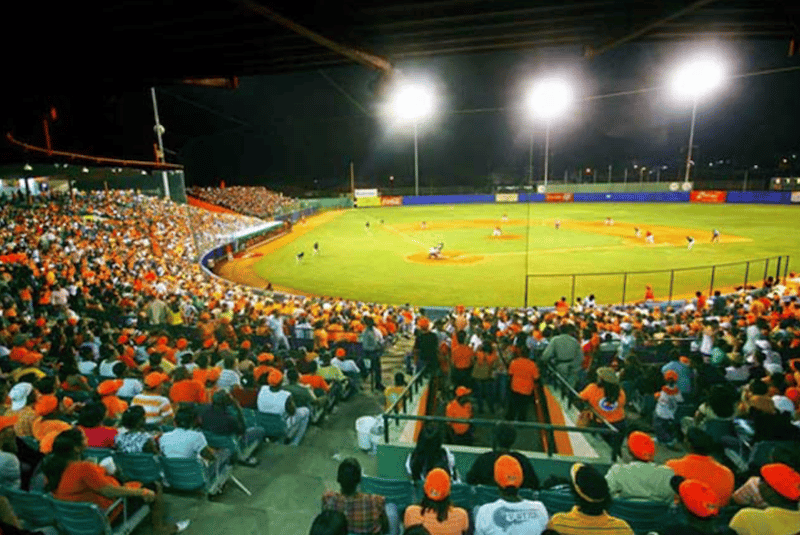 The following play occurred in late November in a Dominican Republic winter league game between Gigantes and Toros. Gigantes had a runner on first when the batter hit a scorching line drive over the center fielder’s head. While the four umpires were rotating, the plate umpire collided with the first base runner who was headed home after rounding third base. The umpire called “Time” and awarded the runner home plate. The runner proceeded to touch the plate. After the defensive manager came out, the umpires huddled and inexplicably called the runner out. The explanation was that the only base the home plate umpire can interfere is home plate. Gigantes manager Pedro Grifol protested the game but it was never heard because Gigantes won the game. Did the umpires make the proper call by calling the runner out? To begin with, it’s important to understand that the umpire, by rule, is treated as part of the ground. Excluding a field umpire who is working in front of the infielders, any batted ball that hits an umpire is in play. 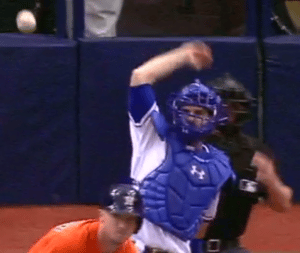 If it is a line drive or fly ball, the ball is no longer in flight. It is treated like a bounding ball. For example, if a line drive strikes the first base umpire, who is positioned behind the fielder and caroms into the hands of the first baseman, it is not a legal catch because the ball is no longer in flight. Any thrown ball that strikes an umpire remains in play unless it becomes lodged in the umpire’s equipment. To say that umpires, by rule, are treated like dirt is factually true. (1) If the field umpire, who is positioned on the infield side (always the second base umpire in a four-man crew) in front of the infielders is hit by a ground ball that is not deflected, the ball is dead. The batter is awarded first base and is credited with a hit. Any runner on base advances, only if forced. (2) If the plate umpire hinders the catcher’s throw to a base when he is attempting to retire a runner. If the runner is retired, the interference is nullified. If the runner is not retired, the runner must return to his original base; no bases can be advanced. (3) If the catcher while throwing the ball back to the pitcher with a runner or runners on base is hindered by the plate umpire, the ball is dead and no runner can advance. In the above play you had a collision between the plate umpire and a runner attempting to advance home. That would not come under any of the three conditions above that would qualify as umpire interference. Because the umpire is considered to be part of the ground, the play should have been allowed to proceed despite the inadvertent collision and if the runner is subsequently tagged out before he reaches home, he should be out. That may seem unfair but that’s life in the big city. In my opinion, because the plate umpire incorrectly called “Time,” the runner was placed in jeopardy since he was under the assumption the play was dead and was awarded home. There is no way he should have been called out unless the umpires were 100 percent sure that he would have been out had there been no collision. This was not the case in that situation. As I see it, when the umpires huddled, they had one decision to make and that is, where to place the runner/s? Would the lead runner have scored if the plate umpire did not collide with him? If so, he should have been allowed to score. If the umpires judged that the runner would not have scored, I would have placed the runner at third base. An out should not have been recorded on the play because the umpire’s incorrect calling of “Time,” most likely affected the actions of the runner. Umpires must be aware when they place a team in jeopardy by making an incorrect call that is reversed, not to further penalize them by improperly placing runners. The umpires need to be sensitive as to who they need to protect. Properly placing the runners when field umpire interference occurs is important. The Cincinnati Reds and San Diego Padres played at PETCO Park on Sept. 25, 2010. In the top of the fourth inning the Reds had Brandon Phillips on second base and two outs trailing 3-1 when Ramon Hernandez hit a shot up the middle that struck second base umpire C.B. Bucknor. The ball was properly ruled dead because Bucknor was positioned on the infield side in front of second base when he made contact with a batted ball that was not deflected. Hernandez was correctly awarded first base but Phillips was improperly allowed to go to third base on the play. In such umpire interference situations, runners are allowed to advance one base, ONLY IF FORCED. Padres’ manager Bud Black, who was voted the 2010 NL manager of the year, should have filed a legal protest on this ruling since it was a misinterpretation of a rule and not a judgment call. Lack of knowledge of the rule almost cost him the ballgame. However, since the Padres won the game, 4-3, the protest never would have been heard. Reds’ skipper Dusty Baker also demonstrated his lack of understanding of the rule when he argued that his team should have scored one run on the play because Bucknor’s interference prevented Phillips from scoring. Baker was not aware that the ball was dead the moment Bucknor made contact with the ball and that Phillips, by rule, was not permitted to advance because he wasn’t forced. Actually, the Reds caught a break because Phillips was illegally awarded a base. If a runner is forced to advance, he is awarded the next base from the base he occupied at the time the pitch was delivered. It makes no difference where the runner/runners are at the time the umpire interference occurs when he makes contact with the ball. Let’s say there was a runner on first who was stealing and was at second base when the batted ball strikes the second base umpire and umpire interference is called. In that case the runner on first would still only be awarded second base because first base was the base he occupied at the time the pitch was delivered. The plate umpire should invoke interference on himself when he interferes with the catcher making a throw to a base. Flores’ arm had clipped the chest protector of West, causing the wild fling. If Flores had retired Victorino at second, the interference would have been disregarded. BTW- when the plate umpire interferes with the catcher who is attempting to retire a runner, if a rundown or subsequent throw is required to retire the runner, the ball is dead immediately and the interference is enforced which means the runner returns to the base he occupied at the start of play. Umpires must be sure that the catcher does not initiate the interference because the runner got a good jump. When an umpire is hit by a throw, the ball remains alive and in play and hopefully so does the umpire. During the 2001 season, the St. Louis Cardinals’ Albert Pujols hit a ground ball in St. Louis that struck second base. Arizona Diamondbacks’ second baseman Jay Bell picked up the ball and attempted to throw out Mark Grace at first but the ball struck second base umpire Larry Young who got in the line of the throw. The ball remained in play with Pujols reaching first base. Young, who was seriously injured, was sidelined for one week. Despite the fact that Young almost lost his life, the mishap did not qualify as umpire interference.